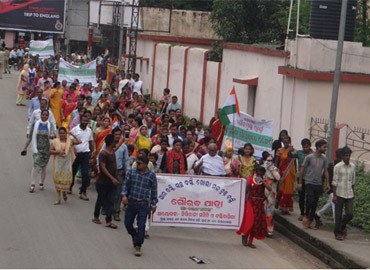 On 9th August, Rourkela Municipal Corporation (RMC) and Rourkela Smart City Limited (RSCL) declared 4 wards as open defecation free area viz. Ward Nos. 4, 14, 15 and 19. To celebrate this achievement, a mass rally was organized from RMC office till the City Auditorium. Nigrani members of the respective slums along with Mahila Arogya Samiti (MAS), Self Help Groups (SHG) and other slum dwellers joined in the celebration. Ms. Rasmita Panda-CEO, RSCL was the Chief Guest and she declared the wards as ODF. Other dignitaries like Ms. Monisha Banarjee – ADM, Rourkela, Mr. P. C. Dash- Urban Development Officer of SAIL,Rourkela Steel Plant joined the celebration and expressed their heartfelt gratitude to Nigrani members for their dedicated efforts. Along with them Mr. Nabin Patel – Dy.CEO, RSCL, Ms Sushama Biloong – Dy. Commissioner, Ms. Sitadevi Majhi- Dy. Commissioner and Dr. B. K. Mishra- Health officer also attended the programme.Various cultural programmes wereconducted by the Nigrani members and children which was highly appreciated by the officials.Lastly Dy. Commissioner. Ms. Sita Devi Majhi gave vote of thanks and the meeting came to an end.